Kenton's Infotainment Scan: All hail the great and gloriously ad-free World Cup 2010! 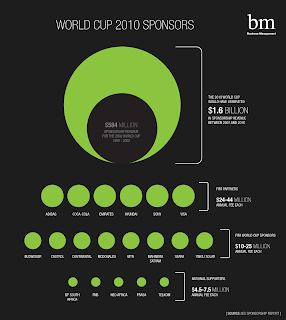 All hail the great and gloriously ad-free World Cup 2010! See the little, blue vertical lines on the white, horizontal DVR bar, above? World Cup commercial breaks. You'll notice that there were three breaks during the midpoint of the game - when there is no game - and two more breaks at the end, during the post-game analysis. The point is that the World Cup may be the last massive sporting event that doesn't spoil gameplay with excessive commercial breaks. Talk about "the beautiful game!" "Great thing about #worldcup : the commercials don't ruin the game. Take note baseball, football, and hockey." Shortly thereafter, I got some tweets back asking how an ad instructor could NOT like ads. Could I be an advertising hypocrite - an ad-hater in the guise of an ad instructor? Could be, but I prefer to think of it as - ahem - a human being being human. "Ad people love commercials - but ads should complement, not ruin, the content they support. Re: the Lost finale!" Ahh, yes, the Lost finale, which ran half an hour longer than first planned to accommodate the rare interest from advertisers, who paid $900,000 per 30-second pop for a total of 45 minutes of ads. The result was a cash bonanza for ABC and an incredibly frustrating experience for home viewers, subjected to one ad break after another at every plot turn. Winnipeggers are so dying for an NHL team, they've forgotten about all of "those times" you go to the game, and the millionaire players stop skating and start "just hanging around" the bench. "Why are they just standing around?" I remember asking my dad at a Jet's game. Oh...yeah. In North America, we build our games around ads, not the other way around, which is why we get ads, ads, and more ads during every possible stoppage in play - including "TV timeouts," game breaks for the sake of ad breaks. I watched "the last five minutes" of the last NBA game of the season, and it took over half an hour of painful viewing to get to the finish line. Break after break followed by foul shot after foul shot. By the time the Lakers won the game, I could give a rat's arse. One of the great compliments you regularly hear about soccer is "the game has great flow." It does, as the incredible documentary, "Zidane: a 21st Century Portrait" (he of headbutting fame, above), shows. The filmmakers followed Zidane - and no-one else - with 17 synchronized high-end cameras in real time during a Spanish Liga Real Madrid versus Villarreal CF game in 2005. Would the beautiful game still have its beautiful flow, were it regularly interrupted by ad breaks? Unlikely. Dear Adidas, Coke, Emirates, Hyundai, Sony, Visa: could you spot me $44 million until next payday? 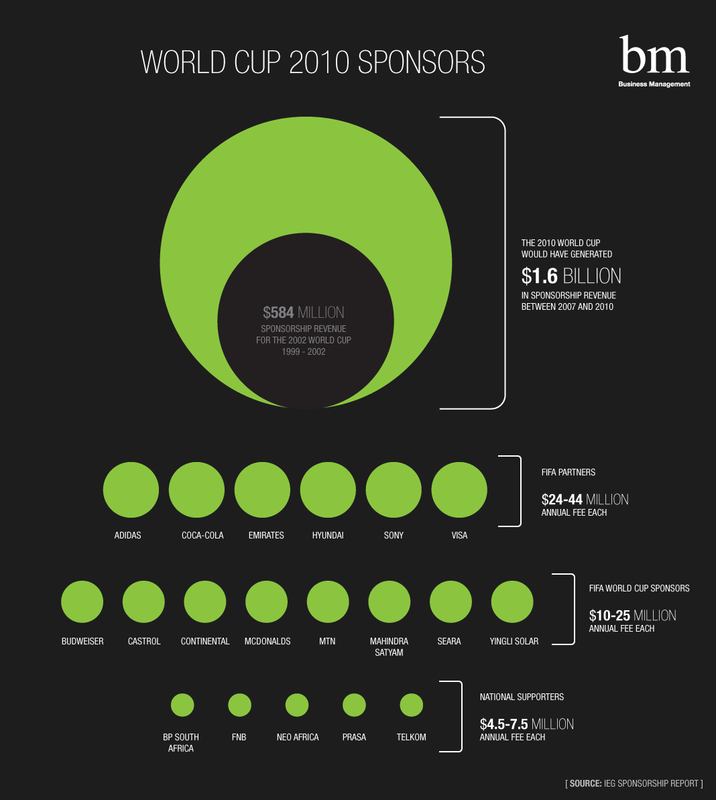 "FIFA's decision to rework its World Cup sponsorship strategy has been hugely successful as...the tournament has generated US$1.6 billion between 2007 and 2010 as opposed to US$584 million between 1999 and 2002." You can read about the juicy sponsorship details in Business Management here. A sponsorship model that works for advertisers, viewers, and the game? Imagine that! The lack of commercials was a rather nice surprise for me four years ago when I first started watching the World Cup. I was glad to see that they still keep it relatively commercial-free. It makes it that much more enjoyable to watch, because I know that if a game is scheduled to be 90 minutes long, it will be roughly 90 minutes long. Actually, Jennifer one of the things I learned about soccer this year is that the games ARE 90 minutes long - every time. They don't stop the clock at all, which presumably is why there are no commercials. You'd hate to have the only goal of the game happen while a McDonald's spot was playing. The question to ask is this: is showing a sponsor's logo along the sidelines or on a player's jersey throughout the tournament worth 44 million dollars? Or would a specifically targeted advertising message be more valuable to a company "sponsoring" the world cup? In the end I think that the NFL or NHL will never adopt this model because they have both sponsorships and advertising in place during their broadcasts - best of both worlds! I definitely love the ad-free aspect of the World Cup, but the one thing is that if nature calls in the middle of a half, you're left with a tough decision to make! It's one thing to miss a goal because of an ad spot, and another when you're responsible for your own downfall. I don't mind hockey so much, since they generally only have three ad breaks scheduled per period (first stoppages under 14, 10, and 6 minutes, as long as neither team is on the power-play or if the cause of the stoppage was a goal). I can't think of a televised sport that has worse endings than basketball, though. Between all the commercial breaks and the fact that much of the action is just players shooting foul shots, it's not exactly building up suspense in the way that a pretty exciting sport should. If you need to go to the bathroom there's always half time. Kenton, thanks for the clip of the Zizou movie - great player headbutt and all. I watch quite a bit of sports and there's definitely nothing worse than the last two minutes of a basketball game that's even remotely close in score. Between the fouling and the endless timeouts, there isn't a longer wait for a conclusion in sports. The ONLY relief is that the timeouts are short and therefore the commercial breaks are usually limited to a single :30spot. As far as missing a goal (or anything else interesting) in sports, that's why we should all have DVRs. Since getting my DVR I've found that I love it more and more each day. I do a lot more time shifting these days and I love zipping through the commercials. I do it so regularly that I often try to fast forward when watching something live, then realize I'm stuck watching the commercials. I do however love ads and will actually stop and watch a spot if it catches my eye, but most of the time I just blow through them because it's the same old crap I've seen so many times before.